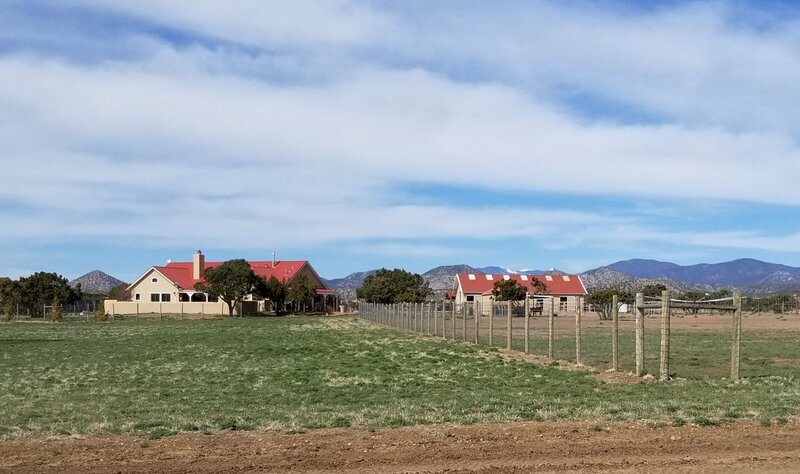 This immaculate, turn-key horse property in Los Caballos with five stall barn with bath and tack room, second two-stall barn with tack room, five corrals and outdoor arena, hot walker, and perimeter riding track is located in one of the most flexible subdivisions for horse enthusiasts, with riding trails directly from the property that span as far as the Galisteo Basin Preserve. Located just South of Santa Fe near amenities at Eldorado, this home has many recent upgrades including new Anderson windows and doors, new Wolf gas range, new boiler and hot water heater, updated lighting and fixtures, new skylights, and three newly-remodeled bathrooms all with attractive details. With wonderful natural light throughout and passive solar design, the comfortable and open floor plan has sliding patio doors that open to the covered portal with mountain views for great outdoor living and dining. A recently-added brick portal with expansive dog run looks out to the horse pastures and the pastoral setting of this home. There are mountain views from every room including the master suite with soaking tub, wonderful glass tile bathroom details, and walk-in closet. The office has built-in shelving and could be converted to a third bedroom. Separate hay and equipment storage. New solar panels reduce utility costs and feed back to the public grid. A 10,500 gallon water catchment and storage system adds to the self-sustainability of this special property.